For the last 11 years or so, Spark Capital has found success by investing in some of the hottest consumer technology startups around: Yahoo’s Tumblr, Facebook’s Oculus, Twitter, and Warby Parker are all Spark investments. Now, says Spark Capital cofounder and General Partner Bijan Sabet, the firm is starting to turn its attention towards a new target — the rising tide of workplace apps that make work just a little bit more fun. And Spark had a big victory in this regard just recently: Trello, a beloved work organisation app with 19 million users, sold to Aussie software giant Atlassian for $US425 million, after raising a relatively modest $US10.34 million in venture capital in its lifespan. For Sabet, who sat on Trello’s board from its early days, it was a personal victory, too. Plus, Spark is also an investor in Slack, the $US3.8 billion chat app that recently staked its claim to the Fortune 500-grade software market with Slack Enterprise Grid, a new product intended for larger teams. 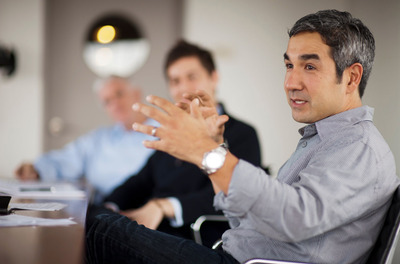 Here’s why Sabet thinks there’s a huge “acceleration” in the market for startups that have more to do with your work life than your personal life — and why Spark is putting its money where its mouth is after years of having it the other way around. Historically, Sabet says, Spark’s interest has really been in companies that combine cutting-edge technology with good design, because those are the products that people actually enjoy using. So it wasn’t exactly that Spark was avoiding business software companies, Sabet says. It’s that, historically, it was hard to find any that fit their criteria. TrelloTrello helps users organise their projects by moving virtual post-it notes around on a whiteboard. Furthermore, Sabet says, the way that business software was historically sold created “natural gatekeepers” — the IT department dictated what hardware and software could be used by employees, meaning that there weren’t a lot of ways that even the scrappiest startup could compete. There wasn’t an easy way to try business software before you buy, Sabet says; we may be used to lots of web-based productivity tools having free-to-use services now, but that wasn’t always the case. “You literally had to take a meeting before you could get a trial version,” Sabet says. This was “liberating,” Sabet says, because it meant that suddenly, those “gatekeepers” were listed. Companies could sell straight to their users, not the IT department. If a small team at a company uses Slack, and their coworkers see them, they’re going to want to use Slack, too. It’s the same network effect that powers the growth of social networks like Snapchat or Facebook, Sabet says, and now it’s starting to hit the workplace, too. And the really great companies, including Spark portfolio companies Trello and Slack, are the ones who are applying a similar relentless focus on the user. Indeed, Sabet says, it’s a “red flag” when startups come to Spark with a business model that’s a little more old-fashioned, with revenue that comes from selling professional services like setup, installation, and training. The companies that he’s most interested in are the ones that can grow in that new, direct-to-user kind of way. And while Slack and Trello found success by focusing on a broad set of office workers, Sabet says that there’s room for other companies, like Mark43 — a Spark-funded tool for law enforcement officers — to find similar success in different industries. As for fears that companies like Microsoft and Amazon could crush these work-focused startups with their own ever-growing rosters of apps and services, well, Sabet isn’t worried. “We’re kind of big on David vs. Goliath here,” he says.